IOR. Pope Francis abstains from revolutionary changes, and ends speculations Pope Francis: Is the papacy according to the media overshadowing the real papacy? 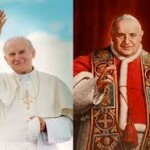 To canonize John XXIII and John Paul II at the same time, Pope Francis has not hesitated to slightly bypass canonization procedures in not waiting for confirmation of a second miracle attributable to John XXIII. And this was most certainly the right course to take. 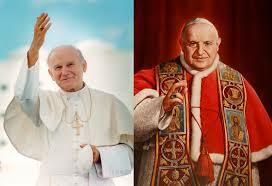 John XXIII and John Paul II are of course different from each other, but they also have many things in common. Without John XXIII, there would not have been a John Paul II. Their concurrent canonizations bear witness to the fact that the Church is a compagnia semper reformanda (an enterprise always to be reformed) as Benedict XVI used to stress. At the same time it shows that every piece in the history of this enterprise is linked to others, like pieces fitting in a puzzle. What do the two men who will be canonized together next April 27 have in common? First of all, they have both been Popes — saintly Popes. They profoundly lived out their priestly spirituality, as their episcopal mottos show. John XXIII had chosen «Oboedientia et Pax» (Obedience and Peace); John Paul II «Totus tuus», an affirmation of our placing of trust in the Virgin Mary. Tear down walls: These words are the marching orders that, more than anything else, bind together the two saintly popes. The ecumenical effort was vigorously pushed forward by John Paul II, who going beyond diplomacy embraced prophetical gestures in dealing with the politics of religions. When he went to Greece in 2001, the first pope going there in 1291 years, he listened calmly to a list of accusations (13 offences) levied against the Catholic Church by the Greek Orthodox. Then, he apologized for errors that had been made. Finally, during a historical meeting at the Areopagus, he affirmed with Archbishop Christodoulos their common commitment to defend the Christian roots of Europe. After that, he broke the taboo of orthodox and Catholics praying together, reciting the “Our Father” with the Greek archbishop. John XXIII had already begun to tear down the invisible wall of the Iron Curtain when the Soviet Union experienced its first cracks. In 1961, the then Secretary of the Russian Communist Party Nikita Krushchev made a first move to establish communications with the Pope, sending a best wishes message to John XXIII for his 80th birthday. John XXIII responded, and a channel of informal contacts was thus opened. When the Cuba missile crisis broke out in 1962, John XXIII was the only moral authority recognized by the two opposing sides. The Pope’s public remarks – which he rewrote almost in their entirety – in the midst of the crisis were even published in the Pravda newspaper, the Communist mouthpiece. The missile crisis was thus overcome. The outcome of that initiative convinced John XXIII to write an encyclical, the “Pacem in Terris”. The encyclical – built on truth, justice, freedom and love as its four pillars – was John XXIII’s utopian goal, and is still current today. John XXIII wanted the encyclical to be written in an innovative way. The encyclical has as its basis the sign of the times, men’s longing for dignity, freedom and peace. From this perspective, the whole of human aspirations are read in the light of the Gospel, and efforts for their realization constitute the pursuit of that integral humanism which would become Paul VI’s marching orders. For the first time, an encyclical had not its basis in Revelation, but in the signs of the times. This inductive method was then applied in the Second Vatican Council’s Pastoral Constitution “Gaudium et Spes”. The aura of “Pacem in terris” also captivates a young bishop taking part in the Second Vatican Council, Karol Wojtyla. He had experienced Nazism and Communism, two forms of totalitarianism that had shaken Europe. His opposition to all forms of totalitarianism led to a particularly strong stance against communist regimes. He opposed them not through direct protests or a frontal attack. Instead, he nurtured young people, educating them on what is freedom and human dignity. It’s humanism saving the world. Wojtylas was one of the most active drafters of the conciliar document “Dignitatis humanae”. The document was an incredibly valuable tool for all the bishops on the other side of the Iron Curtain, who took inspiration from it to form a silent opposition. Wojtyla linked the defense of human dignity to the notion of Nation, which he leveraged in contrast to the notion of State. In the meantime, the so-called Vatican Ostpolitk had begun. Agostino Casaroli is sent to countries on the other side of the Iron Curtain by John XXIII first, and later by Paul VI. He initiates a difficult dialogue, a ‘step by step’ policy which Casaroli defines “the martyrdom of patience.” He builds relations that succeed in substantially alleviating the conditions of Christians in Communist-ruled countries. Once elected Pope, John Paul II chooses Casaroli as Secretary of State. The Pope’s strong stance on freedom and human dignity stirs the aspirations of those living in countries of the Warsaw Pact. At the same time, the diplomacy of Cardinal Casaroli maintains relations with communist countries active, affording the Pope’s position some protective coverage. In the meantime, Paul Poupard, who served in the Secretariat of State under John XXIII and Paul II, is appointed by John Paul II to lead the Secretariat for non-believers, and in that capacity he starts a cultural dialogue with philosophers and intellectuals of the countries beyond the Iron Curtain. On one side, John Paul II’s stances. On the other, Casaroli’s diplomacy. In the background, a behind-the-scene cultural dialogue. This is how another wall is torn down, the Berlin Wall. The images of the fall of the Wall represent the fall of European communism, and a triumph for Catholics. Had there not been a John XXIII, none of this would have been possible. The “shepherd Pope” John XXIII was in fact a fine diplomat. From his pontificate on, the influence of the Holy See in the international arena has increased considerably. John Paul II embraced this legacy. He challenged the United Nations more often, speaking about religious freedom at the UN Headquarters in New York and also criticizing the gender ideology and the notion of reproductive health of the Cairo and Beijing conferences during the nineties. Meanwhile, Vatican diplomats, with skill and finesse, managed to insert the notion of integral human development, like a sort of “positive virus”, in international documents. For example, in a UN document issued in 1985. The “open the window” symbol can be traced back to George Tyrrell’s “Medievalism : A reply to cardinal Mercier“, London : Longmans, Green & Co, 1908, p.183 : Your Eminence, will you ever take heart of grace and boldly throw open the doors and windows of the darkest corners of your great mediaeval cathedral, and let the light of a new day strike into the darkest corners and the fresh winds of Heaven blow through its mouldy cloisters?. What a poorly-written to Peter, Paul, and Mary, not to the Church. 1968 is over — tear down the crude felt banners! Open the doors and let the smoke of Satan enter the Church. Nothing good has happened as a result of these 2 Modernist heresy ascribing popes led the Church away from God. That is why there is no 2d miracle for JPII and zero miracles for “Good Pope John”. The modernist need their saints nonetheless…but the world is being less fooled every Moment. Pope Frank, order the bishops and yourself to consecrate Russia as you have been commanded! Stop disobeying Our Lady! It bad for the Church’s health! Excellent article. The two gentlemen are indeed ‘Saintly Popes’. Questa canonizzazione previsto è un momento epocale nella storia della Salvezza. Se abbiamo scelto di parteciparvi o scegliamo di fuggire e si rifiutano di parteciparvi, ha gravi implicazioni per il nostro destino eterno e il destino eterno di molti. Vogliamo mettere ogni cattolico in allerta circa la grandezza di questo evento e il suo significato nel contesto del Secondo Avvento di Nostro Signore Gesù. I messaggi saremo distacco, metà settimana, non sono da prendere alla leggera, ma piuttosto per essere meditati in modo che lo Spirito Santo ci può ispirare a conoscere la Sua volontà e fare la Sua volontà. I think too often our opinions of Popes can be too influenced by incomplete facts and distorted portrayals from media accounts. Pope Francis is helping us to see a more realistic view of the Papacy. I am more familiar with John Paul II, after reading George Weigel’s amazing biography on him called “Witness to Hope”. This is a 1000 page book that gives (at the time) unprecedented access to a pope. John Paul II was certainly a charismatic leader and in his book “The Pope and the CEO”, the former Swiss Guard Andreas Widmer explained the direct influence of John Paul II on his leadership style. For those who think they know this Pope, I suggest they read both books. Can anyone recommend a good biography on Pope John XXII? four popes four to glorify themselves at the same time: the two models and the two clones…And using the solemn apparatus of the Church they have destroyed!